the waiting is over! 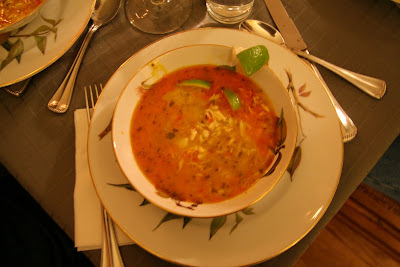 the recipe for the wonderful soup we had on new year's eve arrived! thanks mel!! this appears to be an easy soup to prepare and I can testify that it tastes absolutely fabulous. since the next week is bringing arctic temperatures our way, I think a culinary trip to south america may be just the ticket! 1) Heat olive oil in pan over low heat. Stir in onion and celery, sauté gently for 5 minutes until softened and translucent. Stir in garlic and chili and cook for 2 more minutes. 2) Add the tomato and half the cilantro, increase heat. Cook, stirring constantly for 3 minutes. Add stock, bring to boil. Simmer for 5 minutes. 3) Stir in crab, coconut milk and palm oil. Simmer over very low heat for 5 minutes. Consistency should be thick, but not stew like, add water if needed. 4) Stir in lime juice and remaining cilantro. Season with salt to taste. Serve in heated bowls with chili oil and lime wedges on the side. since my last youtube post was yanked, here's a video to enjoy. no politics - just flip the frog and friends in a classic toon by ub iwerks (1930). That soup looks divine. If it's half as good as your buttermilk pie recipe, I will hereby make every recipe you post. I love these old cartoons! Ooh, yum-yum! That looks and reads very delicious! Looks yummy what do you mean your youtube was yanked and why? I am putting the recipes in the vault!